Southern friends are excellent visitors. To the green, I must go (and I’m not talking about this week’s Arnold Palmer Invitational). But what sorts of vegetables are a great value and come in large quantities? What would be light enough for me to lug on a 10 minute walk through single digit degree weather, and also be delicious enough that my Man Suitor would not even realize he’s being healthy? These are questions that need answers, and the grocery vegetable aisle offers little guidance. Among the Bok Choy, broccoli and cucumbers, a large bushel catches my eye. It’s green, there’s a lot of it, and it’s a great value—It’s kale, and I’m sold. Kale is great because it comes in big ol’ green bushels. My shoulder angel and I make eye contact and do a “Raise the Roof” motion because I know I’ll be set with green for the week without having spent a significant percentage of my grocery budget. The kale comes home and an investigation on how best to use the plant begins. I can’t find a downside; kale wilts easily when heated AND can be turned into a chip. How did I not know this before?! To ease the Man Suitor and myself (but mostly the Man Suitor) into a week of healthy food, I decide it best to start with kale chips. The other great thing about this recipe is that even with a temperamental oven, they’ll cook fast enough and (here’s hoping) no fire alarms will go off. About 1 teaspoon of salt (do you have garlic sea salt? do you enjoy delicious things? Use that instead of regular salt). 1. Preheat the oven to 300 degrees. Take out a cookie sheet (or oven sheet if you have it). 2. 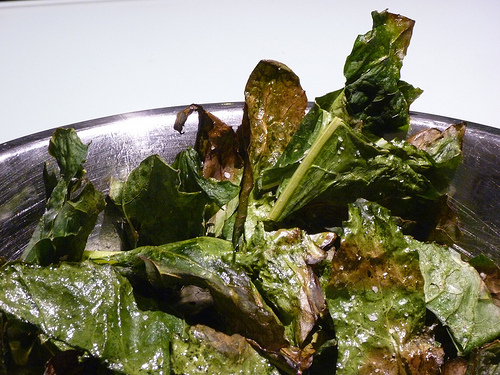 Wash kale and tear off the green bushels. For fancy new cooks, slice the green leaves off with a knife. For the less fancy rest of us, pulling off the green leaves works as well. Tear these into chip-size pieces. Drizzle these little leaves with olive oil and sprinkle salt on top (not too much though, we’re on the healthy train this week). 3. Place kale chips on the cookie sheet (or oven sheet). 4. Bake for 20-25 minutes, or until the leaves dry out. The leaves burn quickly after drying, so keep a close eye out so the leaves don’t burn.